Boeing C-47 Chinook part 1. 2. 71-20955, was known as the "Widow Maker". On 27 April 1983, 71-20955 was performing a mission to an island mountain top in support of the United States Air Force (USAF). 3. 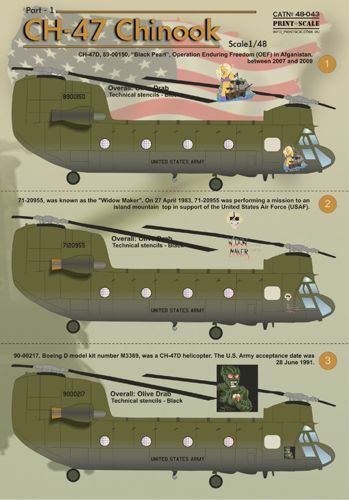 90-00217, Boeing D model kit number M3369, was a CH-47D helicopter. The U.S. Army acceptance date was 28 June 1991. 4. CH-47 67-18452 "Booney Bus". 132nd ASHC aircraft between 1970 and 1971, Vietnam.